"We're not out of the woods," Honolulu Mayor Kirk Caldwell tweeted. All eyes are on Hurricane Florence as the powerful storm churns across the Atlantic Ocean toward the eastern United States. But another storm in the Pacific could bring rain, flooding and dangerous winds to Hawaii on Wednesday. 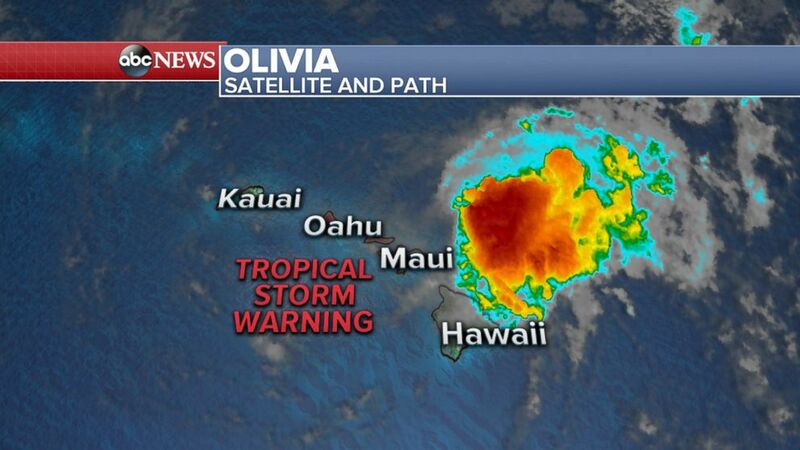 Tropical Storm Olivia has been moving over the Hawaiian Islands near Maui since Wednesday morning local time, carrying sustained winds of up to 45 miles per hour with higher gusts, according to the latest forecast from the National Hurricane Center. 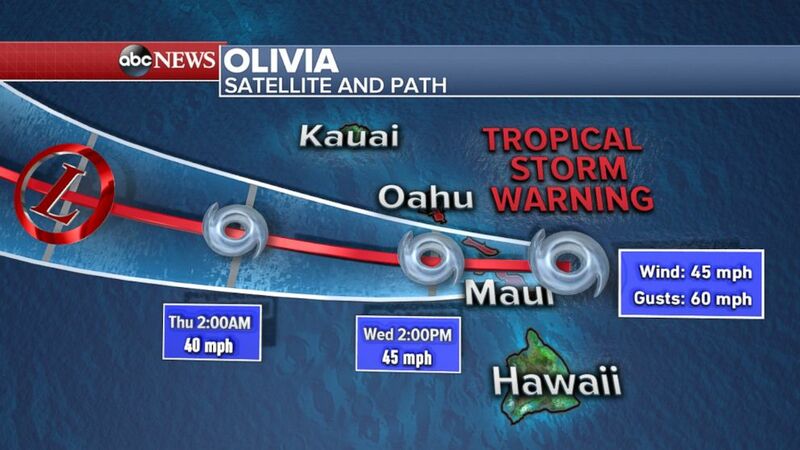 Tropical storm warnings are in effect for Oahu and Maui, as well as the smaller islands of Molokai, Lanai and Kahoolawe. (ABC News) A Tropical Storm Warning remains in effect for some of the Hawaiian Islands, Sept. 12, 2018. Olivia was downgraded from a hurricane earlier this week, and the storm is expected to continue weakening as it approaches the islands. 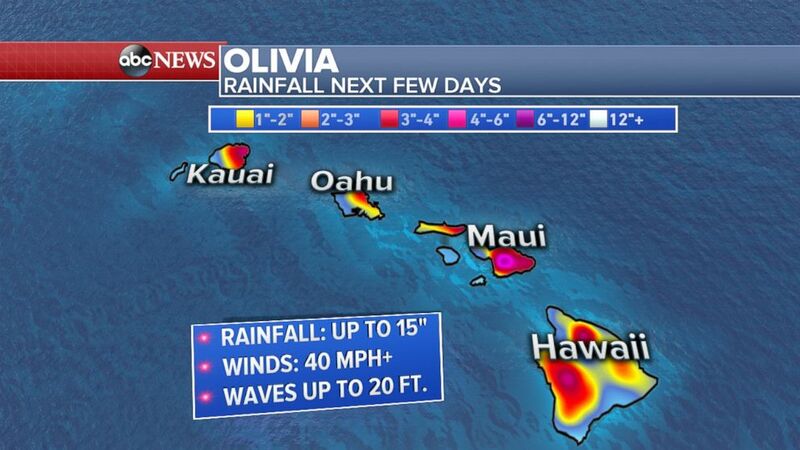 But the storm could still dump as much as 15 inches of rain on Maui over the coming hours as it crosses over the area. Up to six inches of rain had already fallen over parts of Maui by 5 a.m. local time. The rainfall may produce "life-threatening flash flooding," the National Weather Service wrote in its latest bulletin. The storm's winds are also generating large swells hundreds of miles away from shore, resulting in "dangerously high and potentially damaging surf" as the waves break along Hawaii's main islands over the next couple of days, according to the National Weather Service. (ABC News) Tropical Storm Olivia is forecast to begin crossing the Hawaiian Islands on Sept. 12, 2018. All public schools and state Department of Education offices in Maui County were closed Wednesday, and after-school activities were canceled for Maui, Molokai and Lanai to give people time to prepare for the storm's impact. "We're not out of the woods," Honolulu Mayor Kirk Caldwell wrote on Twitter. "We could see heavy rain and tropical storm force winds, both of which could have the potential to cause significant damage." (ABC News) Tropical Storm Olivia could dump as much as 15 inches of rain on Maui as it passes. Hawaii Gov. David Ige has formally requested a presidential disaster declaration in the event that Olivia causes "significant damage and losses" on any islands in the isolated archipelago state. A letter from the governor to President Donald Trump on Tuesday asked for "direct federal support from Department of Defense assets for strategic airlift between the islands; temporary power generation at evacuation centers; technical assistance related to points of distribution and debris management action planning." The governor also requested "immediate access to federal resources for search and rescue, potential medical evacuations, mass care and sheltering commodities and additional temporary power generation capabilities." ABC News' Morgan Winsor contributed to this report.